For the seventh year in a row, Speexx took home a prestigious Worlddidac Assocation Award for its new Smart Learning Solution. The award, which was officially given to Speexx at the 18th Worlddidac Award Ceremony in Berne, Switzerland, recognizes Speexx’ unique approach to microlearning and performance support. Smart Learning from Speexx more than convinced the nine jury members of Worlddidac, as well as the product testers who tried out the learning platform over an extended period of time, to grant Speexx with this award. The innovative user model that adapts to the student’s language level, in combination with the attractive pricing, made all the difference for the judges. “We are very proud of this platform. 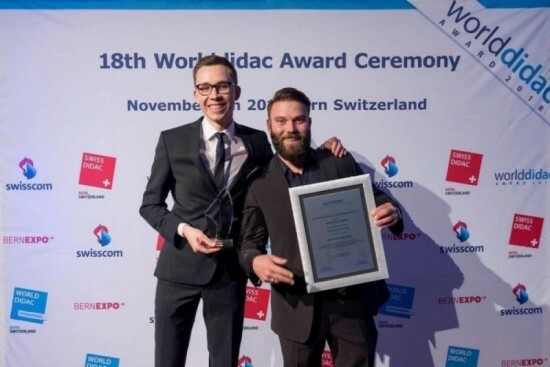 The Worlddidac Award is the first major industry award for Smart Learnings, Speexx Essentials and our unique approach to microlearning and continuous performance support,” said Benedikt, Growth Manager at Speexx. He, along with colleague Tarek Barakat (Digital Marketing Manager at Speexx) accepted the award at the ceremony in Berne on behalf of the company. Worlddidac is the global trade association for the educational resources industry – “where education comes together.” The organization works with all education sectors, countries and relevant national associations to create international sales opportunities for its members. It is the only global association dedicated to the development of education worldwide, serving to create value for all in education. The bi-annual Worlddidac Award is a global recognition of the most innovative products developed in the educational industry worldwide.